Russia’s great 19th century painters presented Russian history with drama and intensity comparable to that of Tolstoy and Dostoevsky. They tell deeply human stories and teach deeply political lessons. Sir Tony Brenton looks at their paintings and explores the world they set out to illuminate. compellingly depicts a powerful, but somehow vulnerable personality. 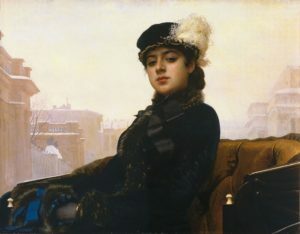 It served for many years as the cover of the Penguin edition of ‘Anna Karenina’, and hung for a while on the walls of the building which is the backdrop to the picture and is now the residence of the British Ambassador in Moscow. SIR TONY BRENTON KCMG worked for 30 years for the Foreign Office. He first learnt Arabic and spent three years in Cairo working on the Middle East Dispute. From 1980-1989 he handled European matters in London and in Brussels, working on energy issues and the birth of European environment policy. Back in London he ran UN issues in the Foreign Office and took charge of preparation for the 1992 ‘Earth Summit’, which achieved the first global agreement on Climate Change. After a year at Harvard (writing a book about international environment policy – ‘The Greening of Machiavelli’), he learnt Russian and spent 1994-1998 in Moscow dealing with Russian economic reform. After a further period in London on UN matters (including the establishment of the International Criminal Court), he was posted in 2001 to Washington dealing with the consequences of 9/11, the Afghanistan war and the Iraq war. In 2004 he was posted to Moscow as Ambassador where he managed Britain’s relations with Russia during a turbulent period. He was awarded a KCMG in 2007. He became a Fellow of Wolfson College in 2009.